Glue Dots® are pressure-sensitive adhesives that are sometimes referred to as fugitive glue or booger glue and consist of a spot of glue about the size of a dime (1/2” diameter). Peel the dots from the release liner by hand. 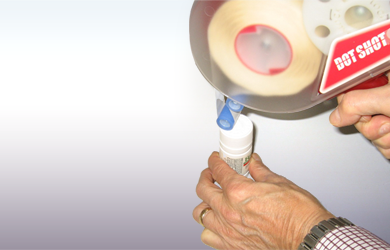 Touch the item to be glued to the Glue Dot®, removing it from the silicone paper release liner. Touch the Glue Dot® to the substrate using adhesive application equipment. 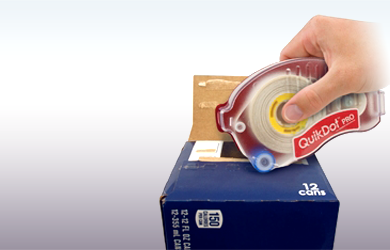 Faster and safer than hot melt glues and cleaner than liquid adhesives, Glue Dots® bond instantly and, unlike double-sided tapes, do not leave a sticky residue. The Right Glue Dots for the Job! Standard Glue Dots are 1/2" in diameter and come in four adhesive tack levels and three profiles. When something other than a 1/2" dot is needed, Custom Products may be the solution. Click here to ask us about our Custom Products. Super High Tack creates a permanent bond. Low or Medium Tacks are considered removable. Low Tack contains some oil. Test absorbent surfaces for bleeding. 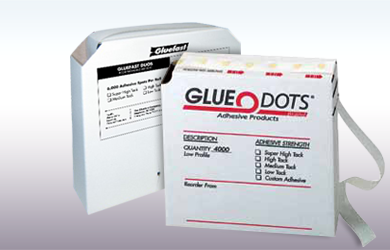 Glue Dots are produced using a variety of synthetic, rubber-based adhesives. To give these adhesives their removable capabilities, varying degrees of oils are used. In most cases these oils will not discolor surfaces. However, the effects of the oils vary based on the absorption properties of the substrate. To speed up testing times, we suggest applying dots to the substrates and heating them up to 150 degrees for three days to simulate results at room temperature after six months. Low profile Glue Dots® are thin and used for bonding level items. 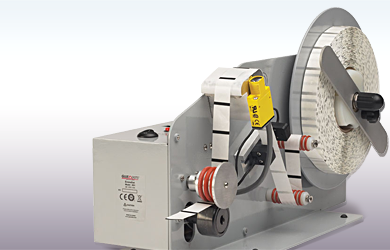 Medium and High profiles are suited for irregularly-shaped objects. Click here to purchase pressure sensitive adhesive Glue Dots® and the Dot Shot Pro applicator for a complete adhesive system from Gluefast. Order one or the other or both online now. Glue Dots® come in a self-dispensing box of 4000 pressure sensitive adhesive dots extruded on a one inch wide silicone release liner. In addition to four different tack strengths, Glue Dots® also come in profiles (thicknesses) of 1/64” (low), 1/16” (medium), and 1/8” (high). Glue Dots® are available in self-dispensing boxes; simply pull the release liner and the spots of adhesive appear for application. 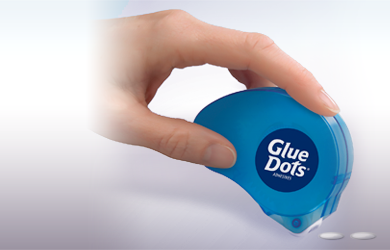 Also available for Glue Dots® is the Dot Shot Pro, an applicator, which is ideal for those who intend to go through a large number of Glue Dots® per day. Read on for more information on the Dot Shot Pro. To dispense and apply the Glue Dots® we offer the Dot’n’Go disposable Glue Dots dispenser or the Dot Shot Pro which uses replaceable rolls. With the Dot Shot Pro, a variety of Glue Dots® products including 1/2” Glue Dots® and the new 1/4” Stitch Pattern are applied quickly, cleanly, and precisely. Fast loading and lightweight, the Dot Shot Pro is available in four adhesive strengths and three profiles: 1/64”, 1/16”, and 1/8” thickness. Special rolls of Glue Dots® are used in the Dot Shot Pro. For example, there are 1500 of the 1/2” diameter, 1/64” thick dots per roll.